I’m not sure where you live, but in Iowa, it’s January and we are all preparing for a great snow fall! Children wait for the snow so that they can get outside and sled. Parents too, wait for the snow so that those same children will go outside. Being out of doors in the winter can be both educational and recreational. 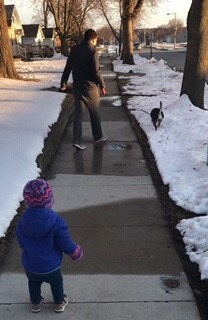 Our Science of Parenting colleague and Human Sciences Creative Project Specialist Kristin Taylor provides some tips for getting out and about during the winter months. Be aware of the wind chill factor before starting your walk. When it’s windy, think about whether you want to walk into the wind when you are returning and warmed up from exercise or when you begin and are warm from your home. Select a route with no snow or ice when possible. Dress warmly in several layers of loosefitting, tightly woven clothing. Wear a waterproof coat, hat, gloves, a scarf, or knit mask to cover your face, and waterproof boots. Be careful you aren’t so bundled up that you can’t hear or see what is going on around you! Use sunscreen of SPF 15 or higher before going outdoors and reapply as needed. Protecting your skin from the sun is important in the winter even if the air and wind are brutally cold. Share your planned route with family or friends in case of an emergency and carry a cell phone, if you have one. Take a break when you begin to feel fatigue. Watch for signs of cold weather health problems such as hypothermia and frostbite. Walk with a friend! It will help keep you motivated. 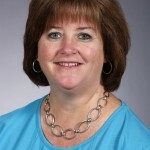 With two earned degrees from Iowa State University, Barb is a Human Sciences Specialist utilizing her experience working alongside communities to develop strong youth and families! With humor and compassion, she enjoys teaching, listening and learning to learn!